Noe eksponert for vind fra nord. En må være forsiktig i forhold til strøm i området fra kaien utover mot brua. Bilde tatt mot fergekaia mot bro. Bilde tatt mot fergekaia fra bro. Fra fergekaia mot brua må en være forsiktig mhp strøm. Strømmen snur vanligvis 1.5t før flo eller fjære for Bergen havn. Nivå 1 i bukta ved fergekaia (Option 1). Nivå 2 (Option 2) Nivå 3 : Site A og Site B. Dive out to the right, down the current exposed wall, to the coral garden at 30m. The whole area is covered in life, and it is common to see Wolf Fish, Ling and Angler Fish. Be careful of the current! Drop down the back of the island. Follow the deep wall round, but keep to a maximum 15m. Swimming with the wall on your left after about 4 minutes, you will come to a small gulley. 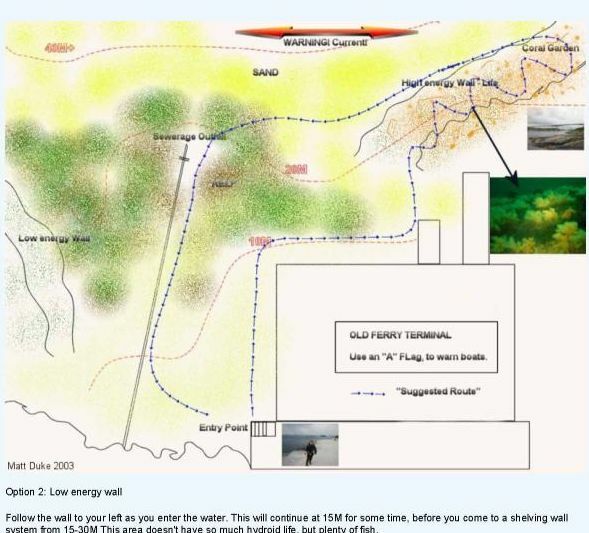 Swim through the Gully, and then start swimming out and down to the right, over the deep kelp to a drop-off that starts at 20m. The seabed is at about 40m. Swim NE (You need the tide to be flooding!! 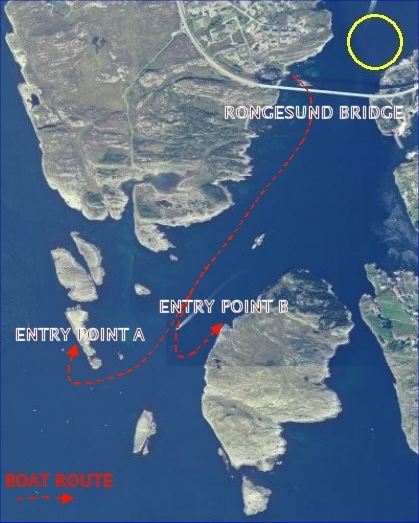 HT is 1.5 hours after Bergen) Keep the wall to your left, after about 10minutes you will see a ladder on the seabed. Congratulations, if you see the ladder, then youve made it to the gully run. Resist the temptation to bottom out at 40m!! This dive is a long one, and you need to try and keep it at 30m. On your left as the gully narrows, you will start to see huge amounts of life on the walls. Plumose anemones, dead means fingers, soft corals. Its hydroid heaven. Then in good viz, you will soon see the shape of the right hand wall come into sight. Hanging mid water at 30m, with a white sand bottom below you, and then the walls getting closer and closer, with not a cm free from coral growth, is awe inspiring. We have had viz of 40m at this point on a flood tide. As soon as you get through the main gully you need to start your mission to get to Mortens wall out to the east of you. Basically you have undulating rock gulleys and slopes at 25-35m the whole way. It will take about 15minutes of work to get across. At this stage the current decides. You will either: 1.) Abort the crossing and head back, coming up in the kelp forests the other side of the entry point. 2.) Get hit by too strong current to make it either way, so deploy the DSMB and abort, or 3.) Have timed it just right, and enjoy a ride over some of the best underwater scenery Norway has to offer. Literally millions of corals and masses of free-swimming fish, before ending up on Mortens wall. By the time you get to Mortens wall, the tide may well have turned, depending on if you hit slack water or not. It doesnt matter, you are on a great wall whichever way you go. Basically a 40+m wall which is subject to strong current. Its covered in life and the furthest part away from the bridge has some impressive overhangs at 10m, and you can also enjoy small jewel anemones and hydroids in all the nooks and crevices. The Small lighthouse is the midway point for this dive. Mortens wall (Called so, due to a SUB-BSI boat owner called Morten, first finding the area) is a nice dive that will suit divers who though experienced, dont feel up to the challenge of swimming the whole way across the fjord at 25-30m But this is still a deep wall, and is subject to heavy current. Divers must use DSMBs and be confident diving deep walls in high current. This is Nivå 3 diving. Denne siden ble sist endret 26. des. 2017 kl. 18:16.